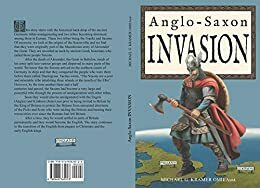 In the year of 449 A.D., King Vortigern of the Britons was agonising about how to protect his people from being constantly raided by both Picks and Scots, who were crossing Hadrian's Wall at will and terrorising the Britons to their south. He tried to get permanent help from the Romans who had left about 32 years earlier. At first the Romans did send temporary help, but it was short-lived. The answer he finally received was that Rome now had too many problems of its own to be able to help on a permanent basis. In due course he contacted the Kimbern War Lords of Hengest and Horsa (twins) and the help was soon forthcoming. What Vortigern did not know is that a confederation had formed between the Engels (also known as Angles), the Kimbern (from the north of the Jutland penisular in northern Germany and the Saxons. these tribes would operate autonomously, but always under the banner of the Saxons. In time the descentants of the three tribes became the English people. The story continues to the end of reignof king Alfred the Great.